-The first story related to "KUMANTONG" was found in this epic thai poem. 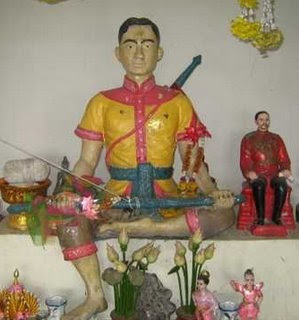 Khun Paen was known to be the person who create the Baby Ghost - Kumantong. 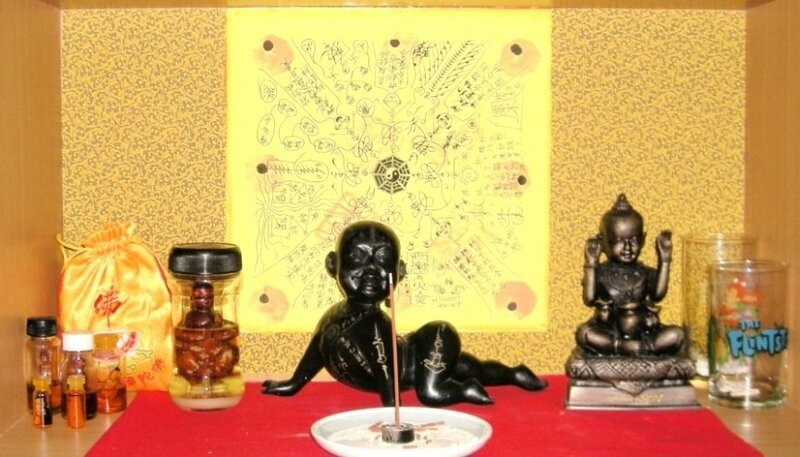 This is how it leads to the practice of robbing tombs for the corpses of babies and young children by the people of 0lden days Siam and making them into powerful Baby /Child Ghosts. Phlai Kaeo (later Khun Phaen), Khun Chang, and Nang Phim (later Nang Wanthong) are childhood friends in Suphanburi. Phlai Kaeo grows up to be handsome, clever, and brave, but he is poor because his father was executed by the king, and the family ruined. He ordains as a novice to be educated, and excels at martial arts and love magic. Khun Chang is his opposite ­– bald, ugly, and crass, but very rich. By age 16, Nang Phim is the most beautiful girl in Suphan. She meets novice Phlai again at Wat Palelai during the Songkran (Thai new year) festival. They have a passionate courtship, but Khun Chang is also smitten by Phim and tries to win her through his wealth. Love triumphs. Phlai Kaeo leaves the novitiate and they get married, even though Phim can already see that he is a great womanizer. After only two days together after the marriage, Phlai is called up to lead an army on a campaign in the north. Phim falls sick from pining, and the abbot of Wat Palelai changes her name to Wanthong to revive her luck. Khun Chang takes the opportunity of Phlai’s absence to spread the rumour that Phlai Kaeo has died in battle, and uses his wealth to tempt Wanthong's mother, who mother consents to the marriage. Wanthong resists at first, but soon comes to enjoy a comfortable life and an attentive, faithful husband. Phlai Kaeo wins victory in the north, and returns with fame as a warrior, and a new wife, Laothong. The king gives him the title Khun Phaen. When he reaches Suphanburi, Wanthong and Laothong have a jealous quarrel. Khun Phaen departs for Kanchanaburi and Wanthong stays with Khun Chang. 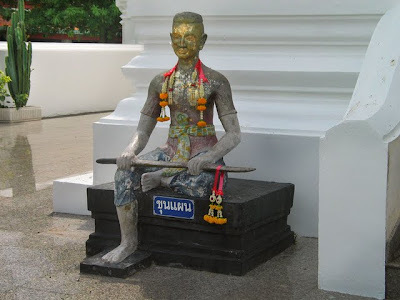 But before long, the king agreed to the sneaky Khun Chang who was bad-mouthing about Khun Phean skipping royal service, therefore Khun Phaen was strip from his rank, given 100 lashes and all his property seized and to take Laothong away from Khun Phean, never letting them see each other again as punishment. Khun Phaen left to stay in the forest alone. Driven with ambition to gain back his reputation and revenge for his love , he needed 3 things to be formidable. He then equips himself with a magic sword, a magnificent horse, and a powerful spirit, Golden Boy - Kumantong. Then he comes to Suphanburi and kidnaps Wanthong from Khun Chang’s house at the dead of night. They flee to an idyllic sojourn in the forest. But Khun Phaen kills two royal officials sent after them, and so becomes a wanted man. When Wanthong becomes pregnant, he decides to give himself up. At the trial, he clears himself, but then angers the king by asking for the return of his second wife, Laothong. He is jailed. Khun Chang takes the opportunity to kidnap Wanthong while she is on the way to visit Khun Phaen in jail. He takes her back to Suphanburi, where she gives birth to Phlai Ngam, a son with Khun Phaen. When Phlai Ngam is 13, Khun Chang jealously tries to do away with him by beating him up and abandoning him in the forest, but he is saved by Khun Phaen's spirits. Wanthong decides to send Phlai Ngam off to live with by his grandmother in Kanchanaburi. Khun Phaen festers in jail for many years. He is released when the king needs him to lead another military campaign in the north. Phlai Ngam, now an adolescent, joins him on the campaign, and starts to follow in his father’s amorous footsteps by winning, Simala, the beautiful daughter of the governor of Phichit. Khun Phaen is again victorious in battle. The king is so pleased that he not only restores Khun Phaen to royal favor, but bestows on Phlai Ngam the title of Phra Wai and two wives – his beloved Simala, and a daughter of the defeated King of Chiang Mai. At the wedding, Phra Wai and Khun Chang get into a drunken quarrel which ends in a court case. Khun Chang loses the case and faces punishment, but Phra Wai appeals for him to be freed. Khun Chang petitions the king to regain Wanthong as his wife. At the hearing, the King insists that Wanthong cannot have two husbands and must choose. But she cannot because each has meaning for her in a different way. The king loses his temper and condemns her to death. Phra Wai appeals, and wins a reprieve. But the order comes too late.